Recently you may have heard about the theft of Chicago RIBber and how we miraculously got it back. Well, I guess it wasn't an actual miracle, more of a casual sighting and phone call, but whatever! Shortly after that and not too long into our ownership of this little bundle of fun we started having issues with our 1960 Johnson outboard. 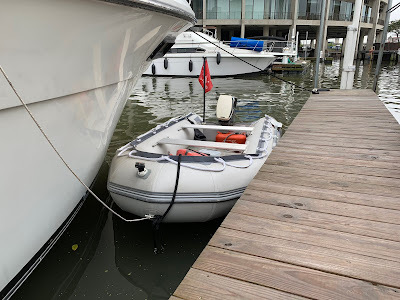 We'd only paid $250 for the motor so we weren't too upset, but it meant we couldn't use the boat other than for rowing across the marina or for a bit of exercise on the river nearby. After consulting the guy we purchased it from and another mechanic we decided it made more sense to replace than repair. For people like us who own a computer repair shop we make the repair versus replace recommendations often to customers but not often to ourselves. We knew we wanted more power to get the little dinghy up on plane easier with two of us and maybe even with three or four people aboard. We also knew the old Johnson was probably going to cost more to repair than it was worth. So we ended up buying a 24 year newer Evinrude! The Evinrude is a 1984 so it's still a classic and has 50% more power. We were shocked to see that the new motor was not only smaller in size but lighter and much quieter too. We were thrilled, and to top it off the guy we bought it from is a tinkerer and likes fixing old outboards so we traded the old Johnson to him in the process. Wins all around. Chicago RIBber waits for repairs. Until we started to lose. The Evinrude ran great for the first few weeks, we made a few trips without any major problems. We did notice the motor would stutter a bit and occasionally stall out, even while underway, but we chalked that up to a highly rich oil mixture in the 2-stroke gas and the thing not having been run through in a while. It seemed to get better the more we ran it and after a few top speed test runs it seemed to run better still. One fateful day while near River City and running fairly fast the motor quit unexpectedly. It had overheated and seized up, we couldn't pull the starter cord and could barely get it out of gear. Kevin rowed the short distance back to River City and parked it, knowing he'd check it out soon. A couple days went by before he could have a look and sure enough it started and ran fine. He played around for about 10 minutes near River City and it seemed to be OK, maybe just a fluke or a plastic bag had gotten caught on the cooling water intake. Our homemade motor stand, just inches from the watery abyss. A few days later a friend who made an award winning short film called RUNNER was showing it at Ping Tom Park just down the river from us. We were excited to go and check it out and figured it was a perfect night to throw a couple chairs, a blanket, and a bottle of wine in Chicago RIBber and head down there. We were taking is slowly at first, not wanting to push it but as we got closer we decided to try to run it at a quicker pace. We weren't going fast, just enough to get on plane. After a minute the engine seized up again, overheated. We paddled a very short way to the dock at the park and chained the boat up. After a couple hours we hoped the engine would have cooled enough to get us back but it was still too tight to pull the starter rope. Kevin was very nervous that we'd done permanent damage by overheating it twice. We should mention that this motor has a little pee indicator. There is a little stream of water that shoots from the back of the engine so you can look and see if there is cooling water flowing through the motor, about as much as one of those "little boy peeing" fountains. This thing was peeing all the time so we assumed the water was flowing. Our great friend Mike was kind enough to come save us and tow us back with his dinghy. Kevin had once gone to save Mike's dinghy one day but Mike got it going while Kevin was on the way, so instead they met at the Tiki bar. But it was the thought that counted and Kevin decided to call in that debt. After we were back at River City it took a little while to actually check the problem. We knew that in about 95% of these situations there is a failure of the rotating impeller under the water that pumps cooling water to the engine. Kevin ordered one and when it came we pulled the engine off the RIB to take a look. When we took the lower unit apart to replace the impeller it looked perfect, like it was brand new. It must have been replaced by the guy we purchased it from. Good to know he was conscientious. What we did find however is a small rubber grommet/seal piece that was ripped. This seal connects two metal pipes that carry the water out of the pump and to the main tube to the engine. The way it was ripped could allow water to pass through but when pressure was put on as the pump moved faster at higher RPM it could fold the ripped area into the flow, virtually cutting it off. We decided this must be the problem. Kevin undoes the impeller housing on the lower unit. Inspecting the impeller and grommet. The drive shaft going through the impeller housing. Another week later that replacement part arrived and we put it in and reassembled the lower unit. We put it on the boat and now suddenly we couldn't get it out of forward gear. No neutral, no reverse. We realized the rod that selects gear that we had to disengage to take the lower unit off must not be reattached correctly. At this point in our Saturday we had plans and had to abandon our attempts to fix the poor little motor. It wasn't for another couple weeks that Kevin had enough time during daylight hours to fix it. Again with the help of Mike he lowered the unit, checked it all and tried to reinstall the rod properly. After some head scratching by both Mike and Kevin the eureka moment finally came and they realized the screw they were trying to get the rod past needed to be removed since it is the part that holds the rod in place. Anyone who's worked on an outboard and done this before will either relate or think we're dummies. We should also mention how nerve racking it is to work on an outboard motor with small and nearly inaccessible screws on a moving dock just inches from the water! This seems to be the bugger causing the overheating issue. Motor finally re-reassembled and back on the dinghy Kevin did some testing around River City. The tour boat captains must have thought he was crazy going back and forth in the same 1/8 mile part of the River but he wanted to run the motor for a while and not be too far away if it died again. After 40 minutes of varied idling, fast running, top speed running, and slow running he declared a clean bill of health for the little engine. One issue Kevin found is the pee is pretty weak, weaker than before, especially at low idle. We're not sure what the cause of that is. A couple days later we ventured to Wolf Point, about a mile and a half away and returned with no issues. We also had a more properly mixed gas tank and the motor ran perfectly. It really moves compared to the 10HP motor we first had. It jumps up on plane almost instantly and cruises very easily at that speed at a fairly modest RPM. The smaller tube sticking down is where the water goes up to the engine. So Water We Thinking about our dinghy now? We didn't use it nearly as much as we thought we would this summer due to the many issues we had. But when we did and it worked - it was great! We also have not had any issue with the BRIS RIB itself, it's great! With fall upon us we can still take trips up and down the river alone or with a couple friends. When spring comes we'll be using it before Cygnet sets sail so our winters will seem just a bit shorter. In Chicago even a day less winter is a victory! See the difference between old and new?